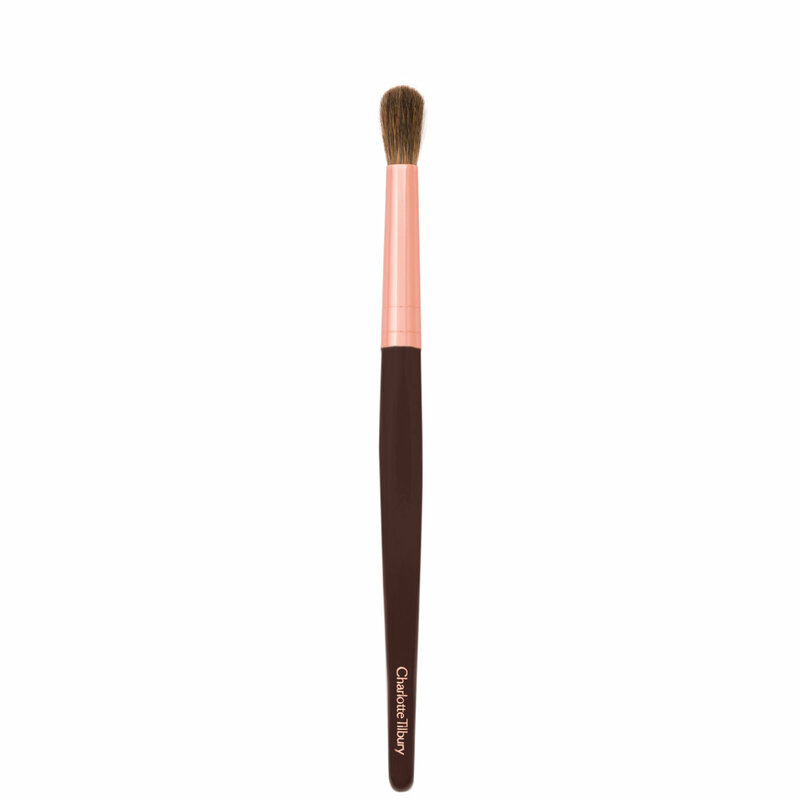 Use Charlotte Tilbury's Eye Blender Brush if you want to apply a subtle wash of colour to your eyes. For a perfect smoky eye, use the Eye Blender Brush to soften the final eye look, by working the brush back and forth along any areas you need to smoke up. This has to be my favorite CT brush. It was surprisingly incredibly soft. Another website has the hair listed as a mix of goat and squirrel hair. If you see my CT blush brush review, you'll see that I listed what I believe to be the OEM for this line as a da vinci brush. They have a website in english as well as a youtube page that you can see how the brushes are made. I've used this brush consistently for 3 weeks already, and liked it so much I bought another one. The second brush shed a hair, but that's about it. I recommend this if you like blending brushes. Its really a pretty brush, but I think what surprised me most was the softness of the natural hair. It applies product and blends it extremely well. I'd been hesitant to try these brushes because I am a bit of a brush snob with Chikuhodo, Hakuhodo, Suqqu, etc. But I finally bought this and wow I am obsessed with it! I have used it every single day since it arrived and i absolutely love it! Its just the perfect shape for blending, it applies color in the crease but also blends it out for you. Its amazing! And it is very soft. Sometimes I have a love/hate relationship with Charlotte Tilbury products but this is definitely a love. Will be buying another one for xmas! This brush is super soft! It doesn't make your eyes water and it is perfect for the crease. It also works great for all over color and blending. This brush worked beautifully with her palettes and other eyeshadow brands. Love it! First of all, picture does not do the justice to this babe. Actual item is way better than picture. Bristle looks rough in picture which got me hesitated for days. There are many soft brushes, but this one you can instantly tell the difference in quality. Design is elegant, length of handle and bristle made it perfect application. I use it for applying eye base color, blending and creating crease. It picks up colors very well also. With all these experience, this babe is definitely value for money. I was a little unsure about buying this brush since I read a lot of bad reviews. I had bought the sculpt brush and, while I love it, it didn't hold its shape at all. But, I wanted to be able to say I owned the brush, so, I bought it. 😂😂it is an amazing blender brush! I adore it! It's definitely a brush that everyone should own. I intend to buy 3 more. I like to own 4 of every brush. It's a must have. This really is a beautiful brush, from the top to the bottom. It's incredible soft like a kitten's paw and glides magically. Charlotte really put her good thoughts and intentions into her brushes. The handle of the brush is quite special and really sets it apart from other professional makeup brushes. It just makes putting on makeup that extra special!